A tracheostomy (also spelt tracheotomy) is a permanent hole cut in the windpipe (trachea) about half an inch in diameter, where a tube is inserted into the opening. The size of the tube depends on your weight and physique. Women tend not to need such a large size. For OSA patients, the tube is capped during the daytime and the person breathes and speaks normally. During the night-time when the person is about to retire to bed, the plug is removed allowing the lungs to breathe directly through the tube. This bypasses any previous obstruction in the upper airway, so totally rectifying the problem. This is a total cure for Obstructive Sleep Apnea, but it's not pleasant. Don't consider this option without a lot of thought. A tracheostomy tends to smell and has to be cleaned morning and night. This is not an easy job and infections are quite common. This is a very last resort solution. The tracheostomy tube requires constant cleaning and care has to be taken to guard against any infection. There are many different types of trachs. This one is a "Shiley Cuffless Fenestrated 8 CFN" type and not very comfortable to wear. Looking extreme left or right and especially upwards, causes the tube to catch on the inside of my windpipe giving me coughing bouts. The actual tube is longer than you would imagine, being just about 4 inches long. It has an inner "cannula" tube which is removable for cleaning. It is recommended that the whole tube be renewed every month, but this is rarely done. It should not be sterilised as this could affect the plastic, but can be soaked in warm soapy water. I found that the strap needed to be changed daily as when you wash, it gets soaked through. The inner cannula needed cleaning every hour or so to start with, but this declined to about every 4 hours and is getting longer as each month passes. I was unable to cap my trach for the first month due to the mucus produced and severe coughing bouts. Update: Since getting a Montgomery tube, things have improved 100% (see further down the page). 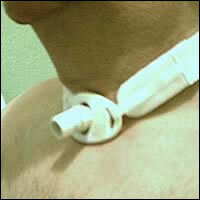 This type of trach tube needs to be held in position by a neck strap. This strap is of a padded type and is slightly elasticised. It has Velcro attachments so it's easier to remove and replace. Without this strap, the tube could come out when you cough. I once used a long shoelace when I ran out of proper straps, but you could use a piece of string as a temporary measure. Some patients use a silver chain to secure them with special clasps that fit the tube holder. I'm told that women use fancy ribbons, but I couldn't find one the right colour for myself. There are a range of covers available and I now wear a special cravat which looks rather smart. Note: The daytime plug can shoot off like a bullet if I cough hard and I've already lost one. This, my wife jokingly refers to as "popping my cork". The Montgomery (or Monty as it is affectionately known) is a much more comfortable tube as it's made out of flexible medical grade silicone. 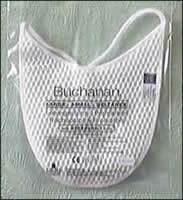 It can be used to replace the standard trach and is highly suitable for obstructive sleep apnea patients. It doesn't need any securing ties or straps as it has an inner flange which stops it popping out. The tube doesn't extend down your throat so total head movement is allowed without coughing. Insertion is done by squeezing the flange of the tube, and then pushing and rotating slightly until the flange is through to the inside of your windpipe. It is then pulled back gently until some resistance is felt and a retaining ring is slide on to hold it in place. It can then be trimmed to a lower profile with a knife. The daytime tapered bung is then pushed in which is very secure. Insertion can be very painful in the early stages until the trach matures. The area around my trach is still reddish and tender. The advantage of this design is that there's no straps to bother about and the profile is a lot less obtrusive, so giving more choice in the clothes that can be worn. It only needs renewing every 12 months, so that will save the N.H.S. a packet. The Montgomery from www.bosmed.com is made in the U.S. and was informed that I'm the first person in the U.K. to have this type of trach fitted (15th January 2003). Well, that's my 15 minutes of fame as they say. Update: Tony P. has had a Montgomery trach since (May 1999). Most hospitals have never heard of them. The only problem I've found with the Monty trach is how it is secured. It won't come out by coughing but it can be pushed inwards. To cough, you need to cover the hole with your finger. I woke during the night with a severe coughing bout. With my finger over the hole and coughing like mad, the tube disappeared inwards with the retaining ring dropping off. 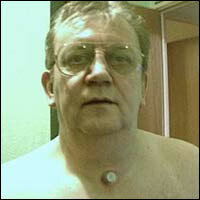 I had to get some tweezers to get hold of it and pull it back out as it had gone in flush with my neck. This now worries me, as if someone is acting about and grabs me around the neck from behind, the retaining ring just doesn't stop it from being pushed in. 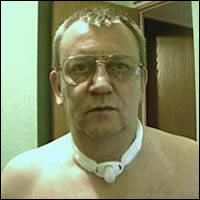 As I usually wear a T-shirt, no-one would know that I have a tracheostomy. When I changed from a Shiley to this type, the first insertion wasn't successful to begin with. I don't know who was more nervous, the specialist or me. He was pushing like crazy for ages (or it seemed like it) but the darned thing just wouldn't go in, so he decided to do it in theatre under anaesthetic. The Monty shown here has been in my neck for over a year without ever being removed, and with no problems (yes, it's a bit scruffy). I have just successfully removed and replaced it with a new one, and very pleased that I managed to do it myself. When I went to get this changed at the hospital (recommended life-time of this device is 12 months), I was determined to do it myself. There was the specialist and 2 nurses with me, as I suppose they didn't know whether I could do it or not. I can tell you now, I was a touch nervous. The new one was already prepared with lubricant on it. I just pulled slowly and the old one come out easily to my surprise. I picked up the new one and pushed it slowly in (you need to be looking in a mirror to line it up). About half way in, I had to push really hard, then I heard a pop as the flanges opened up in my throat. I slowly pulled it back so the flanges were against the trachea wall. Then I coughed my guts up for a few minutes and frightened the life out of the hospital staff. It was just because I'd used too much lubricant and some had gone down my throat. Here's what a clean one looks like. I've now been given a spare one and swap them over about every 7 days, allowing the other one to be cleaning properly. Once cleaned, I store it in a small Tupperware box ready for next time. I knew I'd find a use for those damn boxes. There is no real pain, but it still feels weird doing it. My neck feels a little sore for a couple of hours afterward, but I'll get used to it eventually. I've found that a little antiseptic cream smeared around the trach stops any irritation from the retaining ring rubbing on your neck. 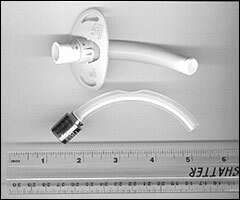 Cleaning a tracheostomy tube can be done in two ways. The best thing I found for cleaning the tube was a pair of 3½ inch narrow long-nose forceps, which I acquired from my local resident nurse. Once you've got any (for want of a better word) awkward stuff out, I then clean it with cotton-buds dipped in a diluted solution of Hydrogen Peroxide, obtainable from most local chemists. This dissolves or softens any crusty bits and also kills any germs. My original plan was to remove it for cleaning every day, but I found this too much to bear. It comes out easy, but pushing the tube back in still makes me cough like hell for a while, so I now only do this approximately every month. Get a replacement tube ready and lubricate it before you take the dirty one out. The removed one can be soaked in hot soapy water and stored for the next change. Be careful what you clean it with. Some chemicals might affect the silicone material and could cause it to split. Cleaning around the outside of the tube is also important. This applies to all tracheostomy tubes. If it starts to smell, this is usually the cause. I started using a "sponge on a stick" thingies that the hospital gave me, but now just use an ordinary sponge and regular soap, nothing fancy! Once you get used to moving your tracheostomy around a bit in your neck, it's not so bad and you soon get used to it. Once it's clean, if I've had any irritation where it's been rubbing on my neck, I smear a small amount of antiseptic cream around it which seems to help. A tracheostomy filter or cover should always be worn (when it is uncapped) to warm and moisten the air inhaled, as well as filter it. Your mouth and nose do this naturally, but having a trachea bypasses these. Available in large or small, they come in boxes of 10. These filters can be washed up to 3 times, then should be discarded. This I learned the hard way as I got repeated chest infections for a while. These covers are scientifically designed to filter air as your mouth and throat would normally do. A great deal of research has gone into the making of these tracheostomy filters, so they aren't just for keeping flies out. When the blanking plug is not fitted, I am unable to speak without covering the hole with my finger (I'll have to get the wife one of these). Although a tracheostomy is very highly effective cure for obstructive sleep apnea, it is an extreme measure that is poorly tolerated by patients and thus rarely used for this purpose. Some very attractive tracheostomy covers can be obtained from www.bosmed.com which are practical and completely hide your tube from view. If you're eating out at a restaurant, these are absolutely great as no-one will notice your tube at all. The scarves just look like a cravat and have a convenient Velcro fastening, making them easy to remove if you suddenly need to attend to it, and easily washed. The backless roll necks would probably be more suitable for winter. The benefits of having a tracheostomy for OSA are that I now don't fall asleep every couple of hours during the daytime, and I probably won't have a heart attack, so I'll live longer. The downside is that I tend not to get invited to too many dinner parties, well not really. In the UK by law, doctors or your specialist must inform the DVLA if you have been diagnosed as having Sleep Apnea. As a result, your driving licence is usually withdrawn depending on the severity. As a Tracheostomy is a total cure for obstructive sleep apnea (but not central sleep apnea), you can then apply for your driving licence back. One thing that I wasn't informed about was that all U.K. tracheostomy patients are entitled to free prescriptions. You need to see your doctor for an exemption form to apply for this.